A temporary shelter for people forced to leave their homes. They look after children with wounds, disabilities, and trauma. They keep track of youth unaccompanied by any close family member – those who are especially vulnerable to abuse and exploitation. Those who are trying to survive on their own in a war. Our team repairs shelters, trucks in clean water, and distributes food. We have partnerships with outside organizations that are able to provide large stores of food, but they have no capability to distribute it. Resources are so scarce and the chaos of war makes normal channels of distribution disintegrate. 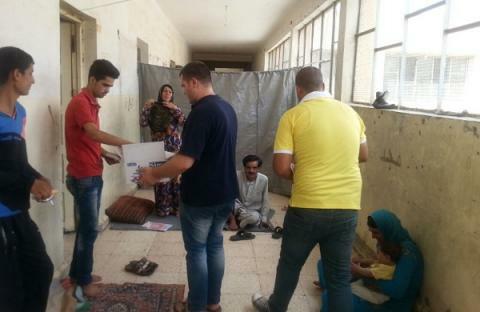 Our team preparing emergency aid distributions. The strength of Questscope is held in the relationships our staff and volunteers have with each other and in the communities where we operate, which means that even when formal infrastructure crumbles – our networks remain strong. We are now the largest distributor of emergency food aid in Aleppo, bringing desperately needed supplies to children and families. The work being carried out in Aleppo is remarkable. But even more remarkable are the people behind the work. They are Syrians living through the same brutal war and have suffered unimaginable pain and loss, but they get up every day and choose hopeful action. They reach out to everyone – regardless of side – to provide life-saving physical assistance and spark a deeper inner healing that flows from relationship and acknowledgment of shared suffering. Roy Moussalli, the leader of our team inside Syria, was among the final nominees for The Aurora Prize for Awakening Humanity. The Aurora Prize recognizes those who have had an exceptional impact on preserving human life. You can read his feature article here.